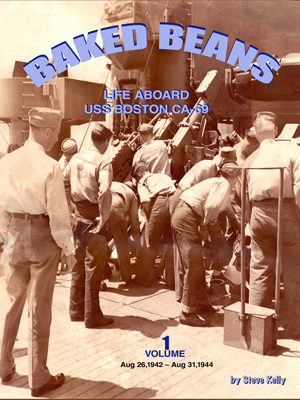 97.5% original, first hand, primary source material, including: photos of the Boston from the National archives; interviews with 4 crew members, diary entries from 2 crew members, original photos, documents and memorabilia submitted by family members, official action reports by the captain, and a few pages from the USS Boston Cruise Book. Material is presented – as much as possible – from the sailor’s point of view, and while it follows “chronological order by month”, it is mostly a look at what it was like to be aboard the heavy cruiser during the Pacific War in WWII. Volume 1 opens with the christening of the ship (Aug 26, 1942) by Mrs. Tobin, wife of the Mayor of Boston, and flows through Commissioning, Shakedown Cruises, transiting the Panama Canal, and onto Pearl Harbor. After a month and a half in Pearl, the Boston is part of the assault on the Marshall Islands. In early March, the crew gets a rowdy initiation into the Realm of King Neptune, followed by action off New Guinea. In mid June, the men participate in the battle of the Philippine Sea. On July 4th, the Boston is the lead ship in the bombardment of Iwo Jima. The book ends with the men spending the entire month of August, 1944 anchored the lagoon at Eniwetok. Order Baked Beans Volume 1 directly from the author and he’ll autograph it for you before he ships it. Charge your purchase here using the secure PayPal site. You may use your credit card or your PayPal account.